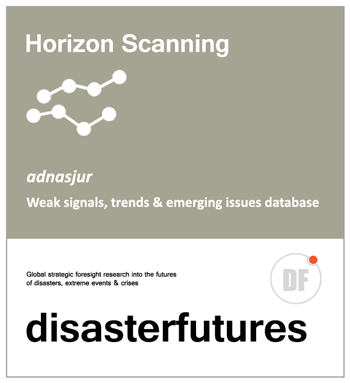 Adnasjur is disasterfutures bespoke horizon scanning database. 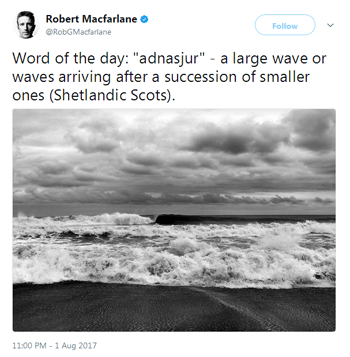 We chose its name as it represents the cumulative flow of larger change over time as a result of the influence of smaller previous events, as suggested in the wave dynamics referenced in @RobGMacfarlane‘s comment. Horizon (or environmental) scanning is a form of information and data identification and collection, and is one of the practical ‘bedrocks’ upon which successful strategic foresight work is based. Through scanning, we establish the current characteristics of the wider environment of interest, in order to understand its stakeholders, attributes, structures, dynamics and relationships and start the process of monitoring for areas of change which could have potential impact in the future. The process is both iterative and recursive so allowing us to change or adapt existing information, add new as it is identifed or remove items no longer of relevance or which have become obsolete or superceded by newer data. In practical terms, our scanning activity is composed of extensive desk research, interviews, surveys and other forms of direct engagement and also by using data gathering techniques such as context brokering and data mining. We use a number of widely recognised typologies and taxonomies to organise and categorise our scanning information, including some that have been customised to reflect the particular needs of the ‘disasters’ area, but all scanning data is subject to more detailed evaluation before it is used either singularly or as an input to more comprehensive or multi-stage futures projects. Our process provides an appropriate level of structure to help guide a consistent approach towards scanning, without becoming burdensome, so allowing us to better monitor quality and agreed outcomes on an ongoing basis.